Wipe My Tears! The Book Description! | My Majid Books! Home » Book Definition » Wipe My Tears! The Book Description! Sensitive Highly Emotional Stories Book! Wipe My Tears! New Book! Wipe My Tears! The Book Description! • I read your article – it made me cry! I gave it to the wife – and she too cried with me! – Indian CEO. • Real visionary and with great realistic foresight – American CEO. • The article was a great eye-opener for me! – British CEO. • Great experiences, ideas and thoughts! – Senior Public Official! This is the Author’s 10th book – and book 6 in the Between Us Only! series. The book follows up on the success of the previous books and furthers the idea of private talks between friends on matters that many are too scared to touch! Often times delving into sensitive critical topics that aren’t always sweet, this enlightening book uses a clear and elegant prose to explore social evils in the society as well as their light hearted counterparts. Covering a variety of priceless topics, this wonderful collection of articles gives readers everywhere a glimpse into the issues that are prevalent in today’s society. 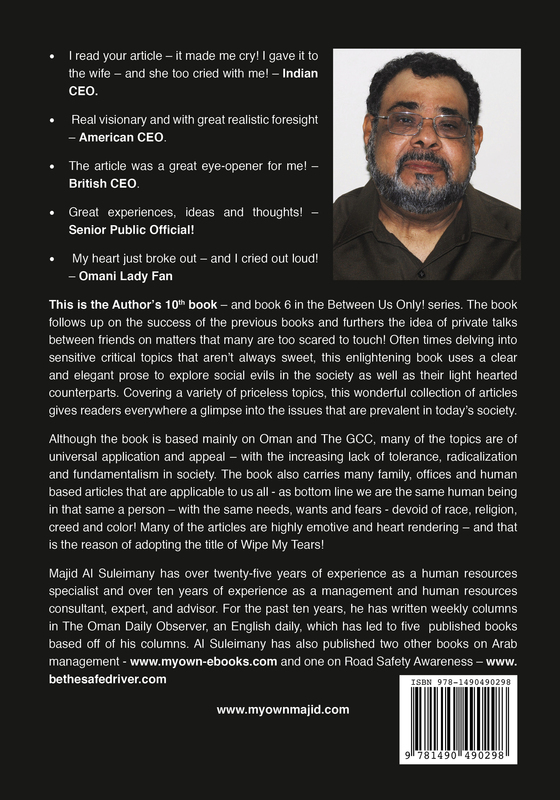 Although the book is based mainly on Oman and The GCC, many of the topics are of universal application and appeal – with the increasing lack of tolerance, radicalization and fundamentalism in society. The book also carries many family, offices and human based articles that are applicable to us all – as bottom line we are the same human being in that same a person – with the same needs, wants and fears – devoid of race, religion, creed and colour! Many of the articles are highly emotive and heart rendering – and that is the reason of adopting the title of Wipe My Tears! Majid Al Suleimany has over twenty-five years of experience as a human resources specialist and over fifteen years of experience as a management and human resources consultant, expert, and advisor. For the past ten years, he has written weekly columns in The Oman Daily Observer, an English daily, which has led to five published books based off of his columns. Wipe My Tears! Book Review!